Puffing Billy Steam Train: A Perfect Day Trip Outside Melbourne! If you’re visiting Melbourne, there are a lot of exciting things to experience. But not all of these are found in the city centre. Heading out 40kms east, into the South-Eastern region of the Dandenong Ranges, makes for one of the best day trips on offer. Suburbs like Belgrave, Olinda, Sassafrass and their surrounding areas are well worth a drive out of the city; with beautiful forestry and fern gullies all around; with small village towns nestled amongst rolling hills and scenic views; and quirky eateries and stores to explore. There is a lot to enjoy in this area; that even a day is not really long enough. 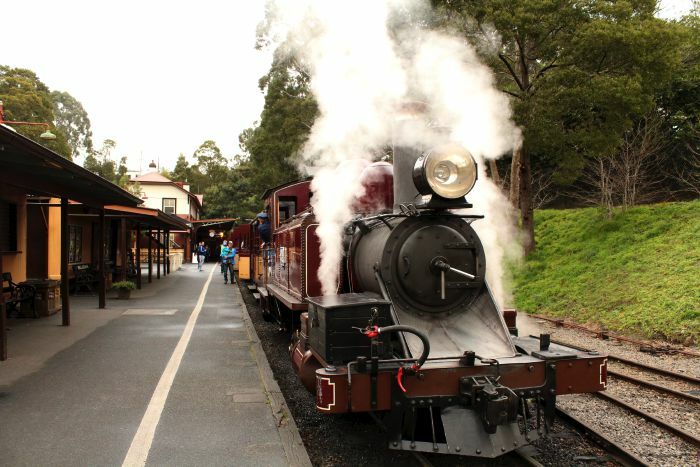 One of the most iconic attractions in this area however, and something that people young and old appreciate, is taking a return trip on the historic steam train, Puffing Billy. If you are a lover of history, enjoy beautiful landscape views or just like the sound of a steam train chugging along, you will absolutely love this. I personally love the journey on Puffing Billy, which I have taken many times throughout my childhood, because it is a relaxing and enjoyable ride that takes you right into the lush forestry of the area; making you feel like you are entering into another world altogether. Add in the steam from the train, which envelopes you in a misty fog along certain parts of the track; and the magic is right there. Opening on December 18th, 1900, Puffing Billy was primarily used as a way to transport farm produce like potatoes, timber and passengers into remote areas of the South-East, along the narrow gauge train line which ran from Upper Ferntree Gully into Gembrook. However, in the years leading up to the 1950s, there had been times of uncertainty and various financial issues; with a real need to use larger locomotives to transport goods, as well as roads being constructed within the region forcing passenger numbers to drop. In 1953, the strain was further impacted by a landslide which closed the track for a period of time. Following this landslide, a group of people banded together to save Puffing Billy. This group rallied for farewell rides to be given to the public in the mid-1950s. The response was so overwhelming however, there was a further push to save it with trial runs being set up and passenger numbers rising significantly in the first few months. This resulted in the formation of what became the ‘Puffing Billy Preservation Society’. In the late 1950s, following the conversion of the Upper Ferntree Gully to Belgrave train line into an electrified suburban train system; it was decided that starting a new line at Belgrave and bypassing the original landslide area was the best option for the survival of Puffing Billy. With little funds and many years of hard work by the society, they managed to complete this with the Belgrave to Menzies Creek line opening in 1962, the Menzies Creek to Emerald line in 1965 and further on into Lakeside in 1975. The line to Gembrook was completely re-opened in 1998. If it wasn’t for the time and dedication of these volunteers so many years ago; and even today with so many volunteers still helping here; Puffing Billy would not be in existence for Victorians and visitors to enjoy now and in the years to come. Beginning at the main depot in Belgrave, Puffing Billy departs a few times every day during Winter months, with an extended timetable in the warmer months. There are no services on Christmas Day or days listed as ‘Total Fire Ban’ due to the increased risk of bush fires in the hotter months. Puffing Billy’s standard journey runs all the way to Lakeside and returns to Belgrave, making it a fun day out whether it is only for a few hours or an entire day. Each journey takes just over an hour to complete. 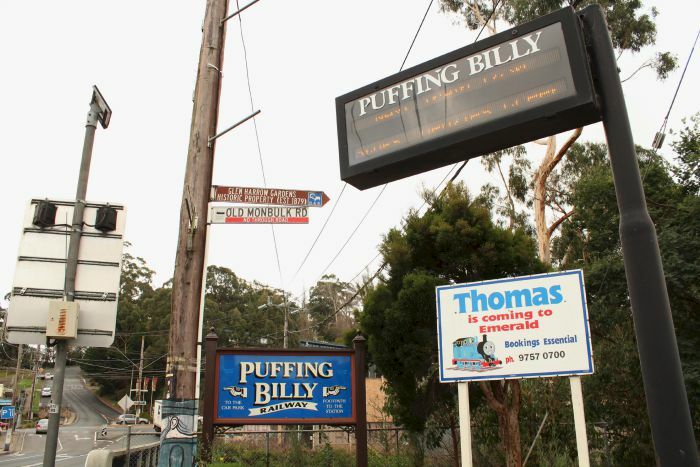 The Puffing Billy station at Belgrave is located on the opposite side of the road to where the suburban Belgrave metro station is found (where trains run to Melbourne). 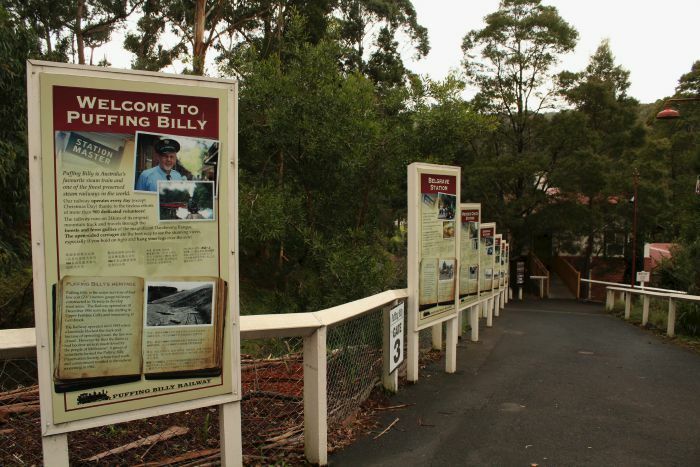 Parking is available next to the Puffing Billy Station side or on top of the hill in the car park bay above the main street of Belgrave. Prior to boarding, make sure to take a photo by the front of the train for the best photo op of your day here; with the steam billowing out and the carriages and station behind you. When on board, you can choose to sit either on the bench inside the carriage or on the window ledge, where you can ‘let your legs hang out’. (There is no age restriction on this, with many adults still kids at heart!) However, if you are less mobile or elderly, then I wouldn’t recommend sitting on the window as it is quite a high ledge to get up and down from. On the left side of the carriage, there are also remnants of the 1953 landslide with part of the old track still visible and a sign highlighting this area when passing it. As your journey gets closer to the Menzies Creek station, there are glorious views of the vast bushland and further on, which can be seen from the right side of the carriage. This is a lovely view on a sunny day; where one can truly feel like they are isolated from everything; adding to the magical feel of the journey. Throughout the ride, there are stops made at Menzies Creek and Emerald, before finishing at Lakeside which is also known as Emerald Lake. This area makes for a fun day out with BBQ facilities, picnic areas, a café, playground, a pool and paddle boats (in Summertime.) You can easily have an enjoyable day here with the family before returning to Belgrave later on. Or you can continue on to Gembrook and enjoy the scenery around there if trains are running. In Winter, there is not a whole lot to do at Lakeside, however you do get a good hour to explore the area and can eat lunch at the café which is nice to do. Ideally, you do want to go on a day that the sun is shining at least to really enjoy it; even when it is cold. It makes it that little more bearable. 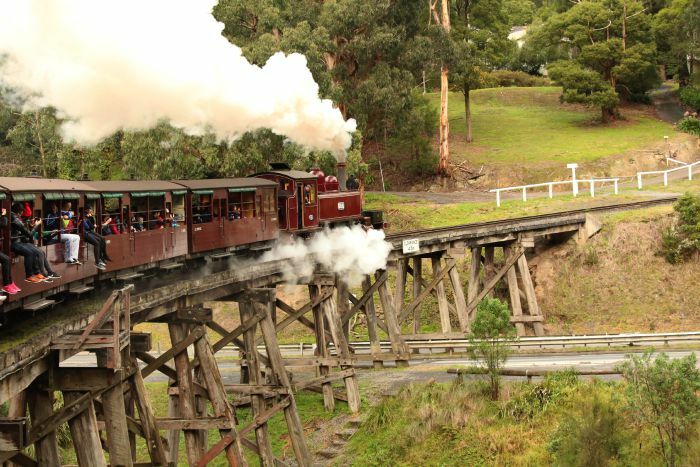 On your return, one can sit and relax enjoying the scenery and views once again, as you make your way back to Belgrave for another steam train adventure through the Dandenong Ranges. Always be aware of the timetable however, because if you miss the last train back, you’ll have to walk back to Belgrave…a very long walk! There are a variety of different Puffing Billy options to choose from, whether it is the ‘Rhythm and Blues’ ride, ‘Dinner and Dance’, Jazz filled journeys, Murder Mystery adventures, Twilight rides, a Thomas the Tank Engine adventure for the littler ones or the Dining Car Experience. It just depends on what type of journey you wish to have. Costs for each of these will vary, with some only being available at certain times or days of the year; so always do your research before heading up there; and always pre-purchase your tickets so you don’t miss out on any journey you wish to be part of. Either way, you can’t go wrong whatever you choose. Whilst it is recommended that standard tickets be purchased online at the Puffing Billy website, tickets are available on the day in limited quantities. Belgrave to Lakeside return Adult tickets are priced at $51.50 with Concessions at $41; Child tickets are $26.50, or you can save further with a family ticket for 2 Adults and 2 Children for $104. No matter what, this is a really fun day out that everyone can enjoy. So, head to Belgrave the next chance you can, and take a ride on this historic steam train. It really is a relaxing day outside the city center…and well worth the drive out there! Need more Puffing Billy inspiration before you go? 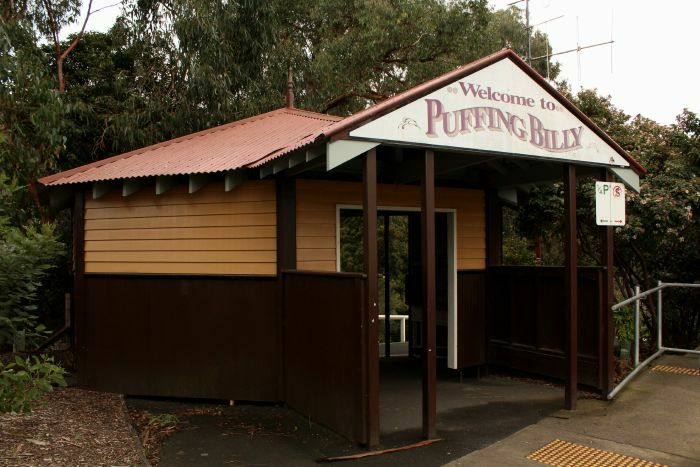 Read Laura from Passport Collective’s experience on Puffing Billy here. Thanks. Great article. Is it too cold to go in winter? Hey Tanto! Thanks for reading! It is colder in winter but they may close the carriage Windows to keep in the warmth, but I went in winter (around July) and it is still lovely and very enjoyable. The train doesn’t go very fast so you won’t feel the wind as you would on another open air carriage. You don’t want a day that is pouring with rain though. But, chilly is fine as the trip is only an hour and you can rug up/bring a blanket with you. Ideally Summer, or warm weather is more preferable just because of the activities that are on at Lakeside and the trip is lovelier on a nice day. But there is something to be said for colder temperatures and being out in the forest. They run a limited service in winter, and plenty of people do it. Enjoy whenever you decide to go! ?